New Hawkfishes on Aliwal Shoal - Eagle Eyes Needed! New Hawkfishes – Eagle Eyes Needed! Hawkfishes, classified in the Family Cirrhitidae are fairly common, conspicuous reef fishes, generally found perching on a coral head, rock or large sessile invertebrate. One species, the swallowtail hawkfish, Cyprinocirrhites polyactis is unusual as it often hovers in the water column, feeding on zooplankton (often amongst a shoal of goldies (Pseudanthias squamipinnis), to which it bears a superficial resemblance). The family comprises around 35 species in the tropical and subtropical areas of all the oceans. Hawkfishes usually grab their food, generally small fishes and invertebrates, in an “ambush” from their perches. Hawkfishes (and fingerfins on the reverse side) will be the subject of our next worksheet (number 8), which we are currently getting ready for the printer. We have recently noticed two additional species occurring at Aliwal shoal, and one of them appears to be fairly common in places. Both look very similar to the widespread, commonly seen Cirrhitichthys oxycephalus, the spotted hawkfish, which probably accounts for their previously overlooked status. If you have photos of what you think may be C. oxycephalus, take another careful look! We would like to encourage members to look out for these two “new” hawkfishes on their dives in Natal. We would particularly like photographers to document their occurrence at Sodwana Bay, as we already know them from Aliwal. Once you know the little differences between the species they are fairly easy to tell apart - even underwater. Remember to keep an eagle eye on those hawkfishes! Cirrhitichthys aprinus, the paletail hawkfish - new! This species is the least common of the three in our area as far as we know. It is also known from the Maldives and the Western Pacific. Attains 12.5cm TL (total length). Diagnostic features for recognising this species are the distinct ocellus on opercle behind eye (often with adjacent dark spot), and no spots on tail. An ocellus is a dark spot ("pupil") surrounded by a ring of a lighter colour ("iris"), usually round or oval in shape (may be slightly irregular in outline). Cirrhitichthys guichenoti, the humpback hawkfish - new! Adult humpback hawkfish, Cirrhitichthys guichenoti. Juvenile humpback hawkfish, Cirrhitichthys guichenoti. This species previously got us excited when we collected a small juvenile at Aliwal Shoal two years ago, having previously only known it from Mauritius and Reunion, and we have been looking for more ever since. On our trip last month, we found three adults on one dive on a reef near Manta Point on Aliwal. Upon glancing at our underwater worksheets we noticed that we must have collected an adult before and confused it with C. oxycephalus; if you look at worksheet No. 3, the fish illustrated as C. oxycephalus is actually an adult C. guichenoti! We had previously assumed that this "humpback" individual was a large adult C. oxycephalus. As is often the case, we are still learning about our marine fishes, and virtually every trip results in us learning a bit more about them - usually finding several new distributions, or sometimes even finding new fish species. Fishwatching really does get exciting! Diagnostic features for recognising this species are lines below the eye and spots covering the entire tail; adults have a distinctive humpback. 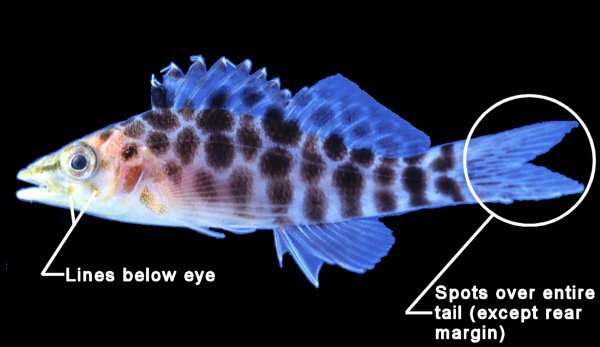 The humpback hawkfish attains 12cm TL. (We were previously calling this fish the longsnout hawkfish, but this is a very similar name to the longnose hawkfish (Oxycirrhites typus) so to avoid confusion, we would suggest using "humpback" as the common name). This is the most common spotted hawkfish species - one you might see on pretty much every dive. For the past year and a half, I have been staring at each one I come across hoping to spot the rarer humpback hawkfish - with no luck until the last trip to Aliwal, when I found a big one (I actually said "woohoo" underwater!). If you are making a note to look for small spotted hawkfishes on every dive you will notice they're quite common on all reefs. We currently have a small one in our fish tank in the foyer of the building and I must say they're pretty "cute" fish, and it seems to be doing very well in there. They seem to be great aquarium pets - reefkeepers will welcome these fishes into their tanks as they don't damage sessile invertebrates (corals), and they look fantastic perched on a bit of coral. 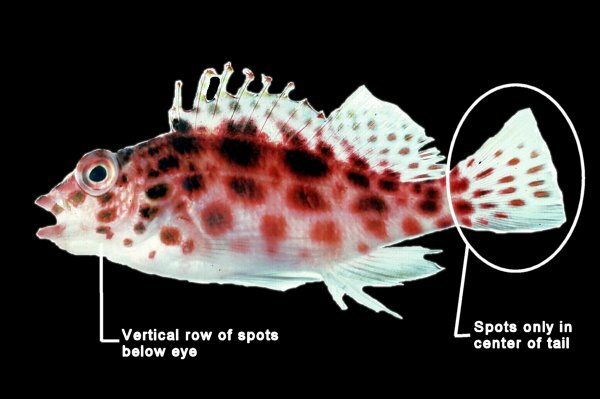 Diagnostic features for recognising this species are a vertical row of spots below the eye and spots only in centre of tail. The parts of the caudal (tail) fin outside of the center are often dusky (slightly dark coloured). This species is very widespread; in the Western Indian Ocean, it is known from the Red Sea right down to East London. In the Indo-Pacific it ranges east to the Marquesas Islands, north to the Mariana Islands, south to New Caledonia. In the Eastern Pacific, it is known from Gulf of California to Colombia and the Galapagos Islands - truly a well travelled little fish! 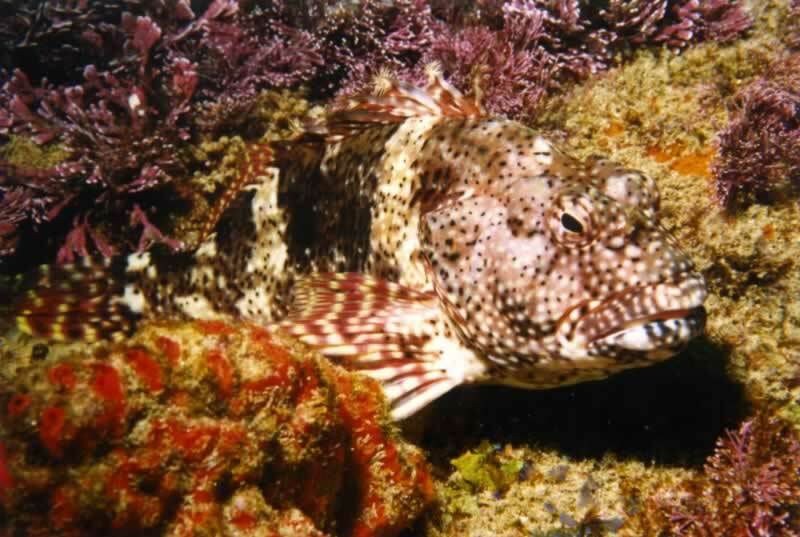 You may be interested in looking for this other unusual hawkfish - Cristacirrhitus punctatus. Several people have sent us pictures of this species and have mistaken it as a small rockcod (Family Serranidae). It is however a hawkfish (Family Cirrhitidae). An easy way to tell hawkfishes apart from other fish are the cirrhi (little tentacles/"hairs") on the dorsal fin spines - which you can clearly see in this photo. The often elongated, thickened lower pectoral fin rays are also a useful diagnostic feature (which fingerfins also share, so take care with that one). 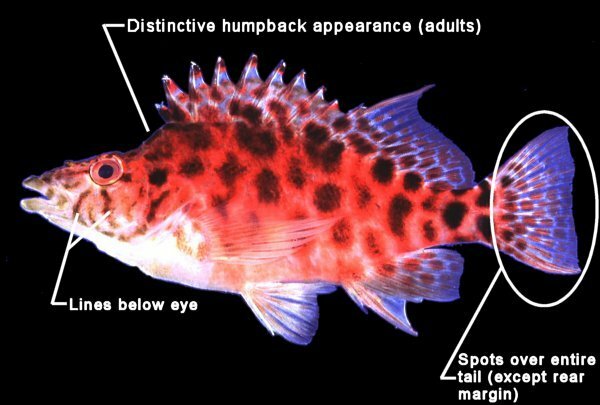 For other diagnostic features of hawkfish, see the illustration at the top of the page. This photo was sent to us by Fish-Watch member Stephen Pain, who photographed it between 8 and 10m at Rocky Bay, off Park Rynie, south of Umkomaas (Aliwal Shoal). (we would like to apologise for the poor image quality and somewhat suspect colour reproduction of these photos; our slide scanner has broken, and we have relied on someone else's previously scanned pictures, which are generally not as carefully scanned as I normally do them).